Traffic making you stressed? Join a vanpool! For stressed-out commuters, joining a vanpool might be one step toward a more relaxed 2016. A UCLA study shows that vanpooling drastically lowers the stress of commuting. Vanpooling has long been touted as a way for riders to reduce pollution and traffic while saving money. While there have been studies on the health benefits of active commuting — walking or bicycling — as well as those of taking a bus or train, the health impact of vanpooling hasn’t previously been studied. “Health Effects of Vanpooling to Work,” published in the journal Workplace Health and Safety, looked at passengers’ and drivers’ perceptions of how vanpooling affected their health and well-being. Participants were recruited through the UCLA Vanpool Program, which has nearly 1500 participants and is one of the largest employer-based vanpool programs in California. Researchers conducted focus groups with 40 vanpool riders and two drivers. 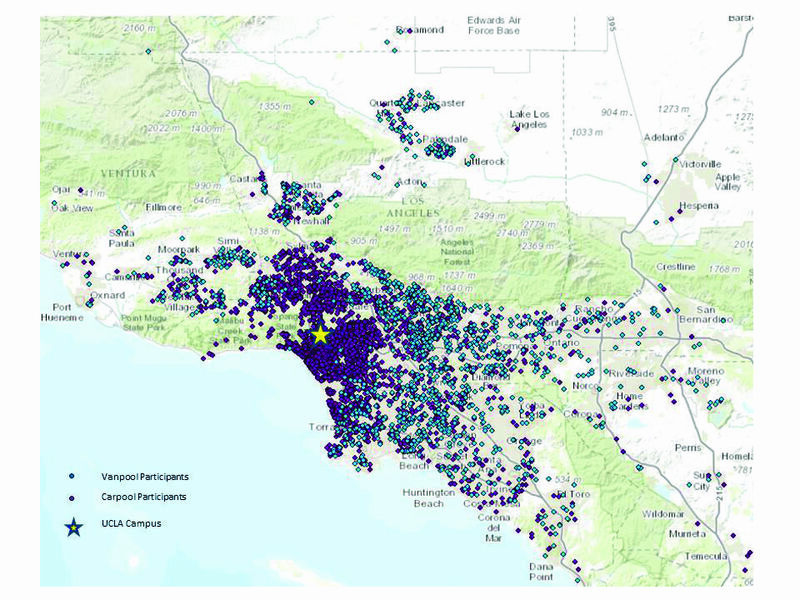 UCLA carpool and vanpool participants commute from far and wide. One of these longtime fans is Stan Paul, who works at the UCLA Luskin School of Public Affairs and commutes more than 160 miles round-trip each day from the Inland Empire. Paul has been a volunteer driver for most of that time. His vanpool gets 10 other UCLA employees to work and back, and takes that many cars off the road. Riders did mention a few downsides, including disturbed sleep patterns and the risk of illness, but they saw these as relatively minor issues. “For many of the vans, napping has become a norm, something that many riders actually look forward to,” Robbins said. The next steps in the research are to quantify the health impacts of vanpooling, both positive and negative, and potentially to develop strategies to address them. For example, if some vanpoolers experience resultant sleep issues, employers could develop programs for employees to improve sleep habits. The study’s other authors were Barbara Berman, professor emerita in the UCLA Fielding School of Public Health, and Dawn Stone, a Ph.D. candidate in the UCLA School of Nursing. The study was funded by the UCLA Foundation/Mary Ann Lewis Enhancement, the UCLA Center for Occupational and Environmental Health, the National Institute for Occupational Safety and Health and the Southern California Education and Research Center.